Like any comparison, you’ve got to look at it objectively and fairly when deciphering who or what has the best credentials. But, even then, a lot of it can be subjective. 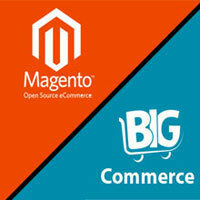 On paper both Magento and Bigcommerce have a very comparable corner. From their tailored packages, template offerings and payment options, there’s little to choose between them. Yet there are some stark contrasts in other areas which will need careful analysis before you determine just who will be crowned Ecommerce Champion of the World. There used to be 3 versions of Magento: Magento Community Edition, a free open source ecommerce platform; Magento Enterprise Edition which is designed for large businesses and Magento Go aimed to support small businesses. However, last year, Magento shut down their ‘Go’ platform and migrated it into the ‘Community Edition’, therefore we’ll be looking at the latter version as it is the most comparable to Bigcommerce. Not quite. You obviously want to secure the best ecommerce solution possible for your enterprise and therefore it is the value for money which is essential. Magento comes in much cheaper, from a start-up perspective, as their entry level plan costs are competitive to say the least. Having said that, Bigcommerce’s pricing structure reveals plans with much more generous options, especially where bandwidth and file storage are concerned. However, the scope of some of the packages may be a little ambitious and not used to their full capacity, if you’re just starting out. Most noticeably, the ‘unlimited’ offerings from Bigcommerce are the main attraction, but will you make full use of them? Perhaps, Magento’s prices are that fraction cheaper because they’re more realistic to what you actually need. Whilst negotiating your way through the pros and cons of each online store builder, it is worth noting the transaction fees. Magento’s pricing structure incorporates these costs whereas there’s no avoiding them with Bigcommerce as you have to be on a specific plan which will cost you more money. So, what are your priorities here? It’s essential that you find what suits you and your business best. Look at the key functionalities carefully. Whilst one package may cater for one thing, you may discover that an alternative package doesn’t have this feature. Don’t base your decision solely on price alone. Bigcommerce scores the extra points over Magento in this round. Basically, a Payment Gateway is a ‘plug in’ to your store that allows it to accept credit or debit cards, and Bigcommerce has a significantly wider range of these gateways. The beauty of this is that when it comes to the sorts of transaction or monthly fees you can concur, it will give you a lot more flexibility. A great way to get a feel for how you want your ecommerce store to look is to make use of both Magento’s and Bigcommerce’s free templates. The free ones are of a similar quality but Bigcommerce are packing a lot more punch in the quantity available. Nevertheless, if you prefer a template which is easier to preview and apply then Magento’s are much friendlier. On the other hand, Bigcommerce offer responsive themes which will automatically display a correctly branded version on your mobile phone! Annoyingly this is something that can’t be achieved whist negotiating templates on your desktop, surely it won’t be long before they resolve this situation? Another irritant of both is that they don’t seem to have categorised themes which results in endless trawling to find something suitable for what you are selling. If any of the free themes don’t whet your appetite or leave you pondering over the potential customisations you’d like to make, there are a plethora of paid for templates you can acquire. Again, Magento undercut BigCommerce when it comes to cost but only marginally. Both providers cater for customisable templates via CSS and HTML, which is great if you are comfortable with coding because you can soon transform a free template in to an ecommerce temple. This is also somewhat achievable through editing via the control panel, although it is a lot more restrictive. So far it’s been a close affair with neither provider being able to back their opponent in to the corner and up against the ropes. As we head in to the latter rounds of the battle, this is where it gets interesting and where it will be won or lost. A critical bit of kit for any ecommerce store is the ability to capture any abandoned cart and its data. The ability to retarget those shoppers and remind them whilst also offering deals on their items in hope that they reconsider is a potential match winner. Bigcommerce have capitalised upon this feature and boast one of the best abandoned cart savers around; granted this comes on one of their more lucrative packages, but it is worth it. Potentially, this feature, which allows automated emails to be sent to those half a job shoppers, can increase sales dramatically without much effort. Magento don’t offer this feature to be built in, you’d have to purchase a third party solution, most likely. The ability to enable your store to be accessible in more than one language is a real catch and Magento are the powerhouses here. The fact that this comes in Magento’s packages as a feature is nothing short of marvellous. This is because if you had to outsource this (like you would with Bigcommerce) the hassle, energy and money spent would be a lot more than the best Magento offering. As we know, Ebay are the godfather of ecommerce and they have a son named Magento. Due to the fact that the ecommerce giant owns Magento, the integration of it is seamless. On top of this, you can effectively run them both from one control panel. Albeit Bigcommerce are no stranger to the Ebay integration game and if you prefer Bigcommerce’s interface and feature set but still want to sell on Ebay, that can still be done. Magento don’t have a blogging facility, unlike Bigcommerce. You may think that blogging isn’t a key part of your marketing strategy, but regularly publishing fresh content on to the web can drive traffic to your online store and increase sales. Therefore Bigcommerce wins this round hands down. Magento may put their guard up and claim that installing a WordPress blogging tool is simple enough but why go through the hassle when you don’t have to? The burning question for most beginners is ‘how easy is it to use?’ and as far as the answer to that goes, we’d have to say Bigcommerce, simply because in comparison to Magento (and other competitors) its user interface is in another realm. This is for a couple of key reasons: Bigcommerce is simple and clean with a minimal, yet modernistic, approach and it guides you graciously through each stage and component whereas Magento feels dated and leaves you to figure it all out on your own. We may’ve been slightly harsh on Magento’s interface, as it’s not all bad, and it’s certainly better than some of their other rivals, but it just falls short when comparing it to Bigcommerce. This is largely down to the idea that Bigcommerce’s platform has been designed with new users and small business owners in mind. There’s no need to use a web developer to design or build your store but you may have to if using alternative ecommerce solutions. Weighing up all of the above up is no easy feat. Regardless of objective and subjective thoughts and opinions, the decision you make should always depend on your own individual requirements. Magento – cheaper, multiple language versions, ‘son of Ebay’ for simple integration. If you’re still undecided, the good news is that you can experiment with the ‘free trial’ options for both and thoroughly evaluate each before opting to invest your money. You may even find you disagree with a lot of this, but each person is different and each ecommerce site has its own desires and ambitions. This little table may help too.